Craving for some beef noodles on a very late night, the girlfriend brought me to this place that she frequented with her dad before. Not knowing where to get my good fix during at night, I am actually happy to hear that this stall is the initial setup stall of the famous Shin Kee Beef Noodles at Jalan Tun Tan Cheng Lock; continued and manned by different people. Arrived right in the middle of midnight; and we're the last and only customer here. Ordered straightaway without much hassle. 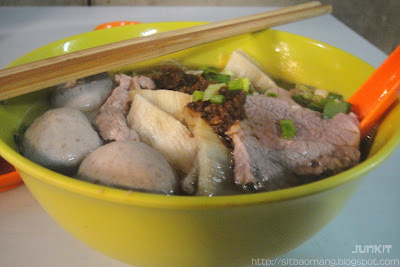 The girlfriend ordered a soup version of the Beef Noodles (RM 6) with standardized ingredients - beef slices, beef balls and beef tripes. The soup here is the winner of all in my opinion, with very sweet and 'beefy' taste which can only be achieved by hours and hours of boiling. I also enjoyed the beef balls very much; bouncy and very meaty. I ordered the dry version of the Beef Noodles (RM6). 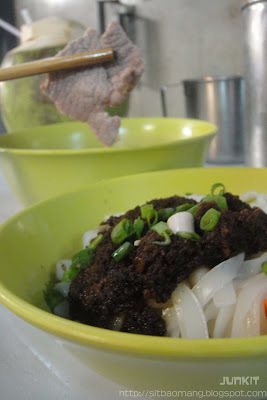 The dry version's noodle are separated from the soup and has minced meat topping. The minced meat was not over-salty and actually tasted very good with the smooth hor fun that I ordered. Didn't expect that non self made noodles could actually win my score, but the simple combination honestly just did. I also specifically go for just the beef slices as I'm a big fan of it. For RM6, this is very worth as they give roughly 7-9 pieces of beef slices, along with a big bowl of soup to go with. I have seen more 'famous' places that is so stingy with their soup and serves like 1/2 portion of a small bowl of soup. Address : Couldn't really specify the direct location, but from what I've observe: Come straight from the main entrance of Petaling Street, go straight till you reach the T-Junction and turn right towards Hong Leong Bank. The landmark is the Tang City Food Court. San Kao Yu is located directly left side in the lane. 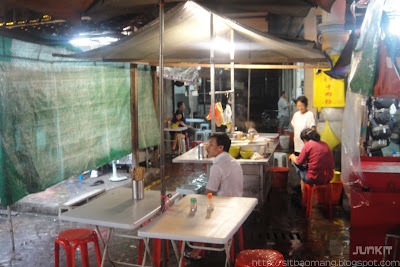 Another landmark is that this stall is located at the same row as the famous Foong Wong Bakery.